There has been a fair bit of work done on Celtic Spring since the last time I showed it, but it has not all been forward progress! 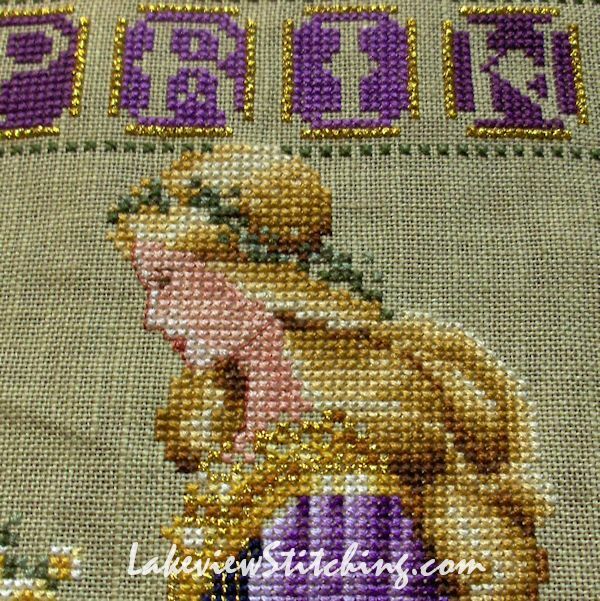 Once I decided to stitch all the gold braid double, I also decided to remove most of the previous gold stitching that had been done single. 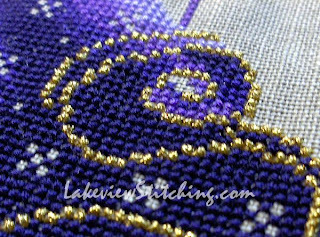 This necessitated taking out some of the other stitching around those areas as well. The main areas that were affected were the left side border, and the front of the underskirt. The chart also calls for a dark quarter stitch to fill in the eye, but I left it unstitched to give the effect of a highlight. I am very keen to start putting in some of the beads. There are lots! But I don't want the stitching to become awkward to hold, so I think I need to give that some more thought. 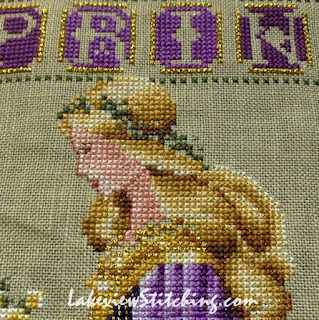 I know from experience that doing all the beads at once can be tiresome too, so balance is key! I'd rather hoped to be further along on this by now, but, you know, life gets in the way sometimes! Boo for small blurry pictures! It's looking good - your choices are giving it real dimension. The eye looks great. 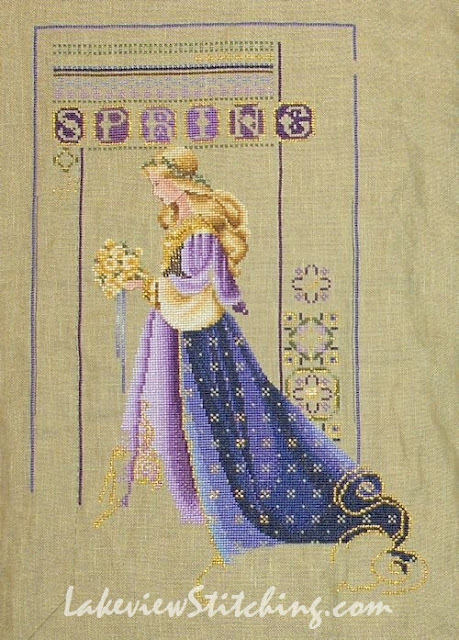 The gold is lovely, but then the whole piece, with its blues and lavenders, is a lovely combination. Thanks Katherine. Purple is usually the last colour I would buy at the store, but it is certainly looking great in this piece. It has given me a new appreciation for it! Thanks, Mary Ellen! It is such a great pattern, isn't it? Wow, she is so beautiful.